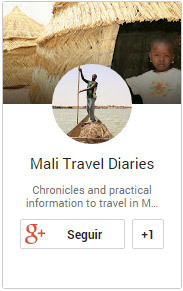 Mali Travel Diaries is small blog that chronicles useful and practical information to travel to and within Mali in West Africa. With the idea that sharing experiences helps travellers, this blog counts with more than a few pages about several subject and topics about Mali: why to travel; when to travel; how to go; where to stay; what to see and what to do. This information was gathered in a 2 week travel around the country, and only a few destinations were visited and reported, giving room for a future travel to improve and update this blog with other interesting places and best destinations in Mali. On the 1st stage of this blog (from the first trip in May/June 2008), you’ll have available information about Bamako, Mopti, Hombori, Gao and Timbuktu – and it’s respective lodgings (where to stay in Mali), restaurants (where to eat in Mali) and transportation (how to travel in Mali). On the 2nd stage of this blog (after a second trip soon), you’ll have available information about Djene, Dogon countries and excellent information on how to travel overland from Europe to Mali passing Morocco and Mauritania at ease. Feel free to comment any page with opinions, questions and ideas.